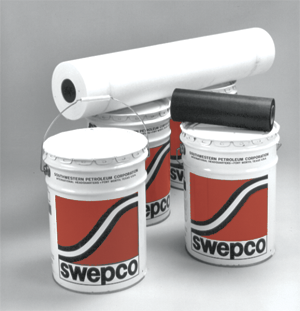 SWEPCO Products are formulated and engineered to be applicator "friendly". With SWEPCO's "cold process" products there is no need for time consuming, dangerous or complicated application steps. Most products are applied by simply by pouring them out and brushing them smooth or by spraying with airless spray equipment. But even the best products must be applied properly, at proper coverage rates to properly prepared and recommended surfaces; so in this section we provide detailed application instructions and videos for SWEPCO Products and Systems. The application information below is provided for the use of all persons who are to apply SWEPCO Products. Please read these application specifications and all product container labels thoroughly before proceeding with application of any SWEPCO Product or System. Careful attention to the application specifications contained in these documents and on product container labels will insure superior service from SWEPCO Products. For additional technical information or questions concerning application of SWEPCO Products or Systems, please call Southwestern Petroleum Corporation TOLL FREE at 1-800-US-SWEPCO ( or 817-332-2336 if outside the USA) between 8 AM and 5 PM CST and ask for the Application Services Department. Or you can write Southwestern Petroleum Corporation, P.O. Box 961005, Fort Worth, Texas 76161-0005 USA. You can also Fax us at (817)877-4047 or email us at bpusa@swepcousa.com. This page is still under construction. Until it is complete, you can find detailed application information for all SWEPCO Products by going to the Products section and looking on the Literature tab for the Product Data Bulletin. You can also find detailed System Application Guides in the System section under the Literature tab.